When people think of Maine, they think of thousands of miles of rocky coastline, vast forests, lakes, rivers and Moose. The biggest question for people is how to find moose. 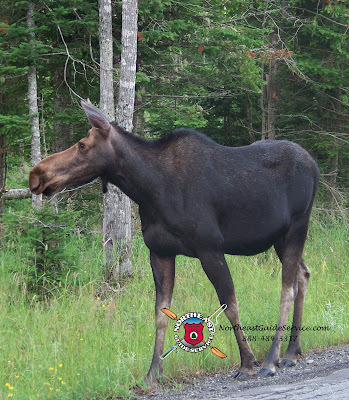 When you are not from Maine, one would think that Maine's moose would simply be strolling down the streets and that Maine people see moose, like they see their neighbor each day at the post office. Not so. Moose live in forested areas where there is snow cover in the winter and lakes, ponds, bogs and streams the rest of the year. Moose are elusive. Even with their massive size, they are dark and slip into the forests away from the roads people travel on, without ever being noticed. If you are spending your vacation in Maine, more specifically in the woodlands of Maine, there is always a chance to find a moose. But, I always ask people when they ask me how to find moose, do you want the chance of seeing a moose or do you want to increase your chances by going with a Registered Maine Guide to see a moose? For most people, there vacation to Maine is time restricted. People are trying to pack in all that they can see and do in our beautiful state. When that is the case, most opt for hiring a Registered Maine Guide to take them to scenic and remote woods ponds. The neat thing about a guided Maine moose watching tour is that you will learn about the area, but also learn how to find moose, so that when you are on your own, you have the necessary skills to seek out moose for photos. Consider visiting Maine this year and rather than chancing finding a moose during your vacation, hire a Registered Maine Guide to take you to the best spots for moose watching in Maine. You will no longer need to ask, how to find moose.